JMA is onderdeel van Young Friends of the Earth The Europe en dat betekent een groot netwerk, vol met geweldige jonge mensen met een hart voor de zaak. Wij zien iedereen elk jaar weer tijdens het zomerkamp, de conferentie rondom COP en acties op Europees niveau. Wij zijn hartstikke blij met zoveel jonge activisten en hun acties dat we daarom in de komende tijd langs elke Young FoE groep gaan met een blog over hun land, de jongerenparticipatie rondom klimaat en wat zij van JMA en van het 25 jarige bestaan vinden. We trappen de Europese serie af met Scotland. My name is Zivile and I am a member, or official secretary, of Glasgow University Climate Action (GUCA) society, which is currently affiliated to Friends of the Earth Scotland (FoE Scotland) and thus on the European level is known as YFoE Scotland. Although we are a very newborn group of YFoEE network, GUCA as a society has been operating within the university boundaries for more than 5 years now. Although we are still heavily recognized as a student led society, from 2015, we opened our doors and minds to young people, who are not particularly involved in the university. 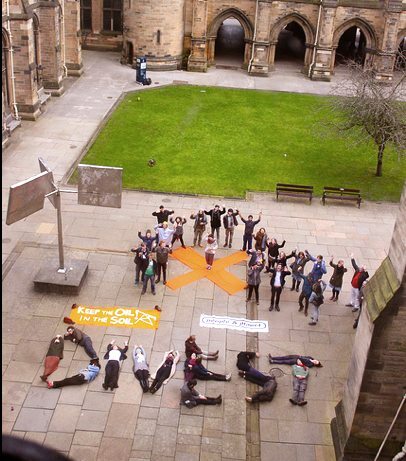 In 2014 we started our first active campaign, calling on University of Glasgow to divest its current shares from fossil fuel industries. The campaign picked up pace and in the start of 2015 we already got the results - University of Glasgow became the first university in Europe to officially announce that they are moving away from dirty fossil fuel projects. This boosted up our confidence and numbers of members, as well as, gauged interest from other social justice groups to join us. Planning our next steps after the fossil free campaign, we decided that we want to go wider than the university boundaries and recognized the importance of joining the wider European network. Since then, we focused on the UN climate talks in Paris - with some of us following it closely in Paris, and most of us tracking it from home. 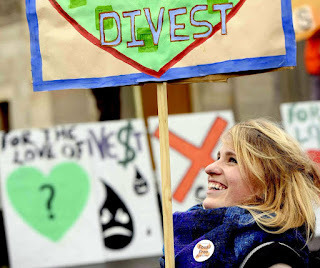 In the meantime our group has also started building capacity for our new campaign - Fossil Free Strathclyde, lobbying on Strathclyde Pension Fund (second biggest pension fund in UK) to divest its current holdings of £752 million pounds from Fossil Fuel industries. 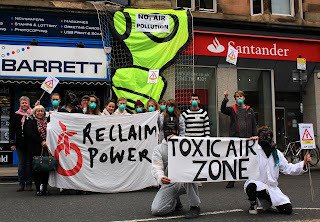 Fossil Free Strathclyde is considerably broad campaign, as it involves 12 different councils and over 200,000 people involved in it, thus we cooperate with many different groups and people to make it happen. The campaign is also run as part of the wider network of Fossil Free Scotland, which was created by FoE Scotland. Apart from divestment campaigns that GUCA has been and is heavily focused on, we run short term campaigns. Example of such being our ‘Don’t Cross the Red Lines’ Campaign which in upcoming elections for the Scottish parliament is pushing different political parties to actually meet their climate targets. And although Scotland is doing quite well on the international level, we have been failing to meet our personal carbon reduction targets for 4 years now. As generally, Scotland, doesn’t have wide youth participation in climate justice struggles, this campaign allows us to interact with other universities mainly in Glasgow and Edinburgh, meet their students and spread climate activism beyond us. When it comes to climate change and justice in Scotland, youth in-activism has been always stumping on our groups activities. Although GUCA is well established, we are struggling to find other youth climate activism grassroots organizations to collaborate with and expand our campaigns. Nonetheless, we are working a lot towards establishment of bigger and more centralized network, that would involve interested individuals, and would encourage them to take an action. The following YFoEE summer camp in 2016 in Scotland, will hopefully be first step to this. We are supported by FoE Scotland, who are helping to bring 20 Scottish participants, from different regions, together, and use this time to map our struggles and activities, as well as, to build a wider and more intersectional climate justice youth movement. This is bringing very exciting times ahead for our group.